Former Ghana Under-17 coach, Paa Kwesi Fabin, says he is looking forward to staging a successful campaign when he guides the Uganda Under-17 side to the African Under-17 Championship in Tanzania in April. His assurance comes two years after guiding the Black Starlets of Ghana to win silver at the competition in Mali. 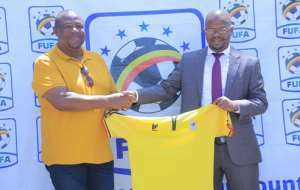 The former Asante Kotoko and Hearts of Oak gaffer who was unveiled at the Federation of Ugandan Football Association (FUFA) House in Mengo on Wednesday will take charge of the Ugandan youth team for the next one year. Fabin, who expressed excitement and optimism about his endeavours with the Ugandan junior side, also stated that he would need the maximum cooperation from stakeholders in order to succeed in his new role as the youth team head coach. “The time is very short but I have assured the FUFA president that I will give the best of my shot. What I will need is the maximum cooperation of everybody because in football no one person can do it all so to be successful you need the help of everybody”, Coach Fabin noted. However, FUFA president, Moses Magogo, praised Fabin’s experience with youth teams and hoped his experience would come to bear and help develop the Ugandan youth side. "We have had the position of the Under-17 national team head coach vacant and as FUFA, we needed someone who has experience with the young players. “We also needed somebody who can break the contacts with Europe so that probably some of our players can break through the ranks. We believe that the person we are bringing in will come with a lot of experience at International level working with younger players". “I, therefore, take this moment to announce Fabin Kwesi Samuel as the new head coach of the Under-17 national team. He has experience with such teams having coached the Ghana Under-17 national team. We, therefore, welcome you to Uganda”, Mogaga said. Coach Paa Kwesi Fabin guided the Black Starlets to a second place finish in Gabon 2017 and to the quarterfinals of the world cup in India.